Hi. Continuing on with another card made at Sunday’s workshop. This card uses the reflection or mirror technique. It is much easier to do than I thought and everyone loved it. 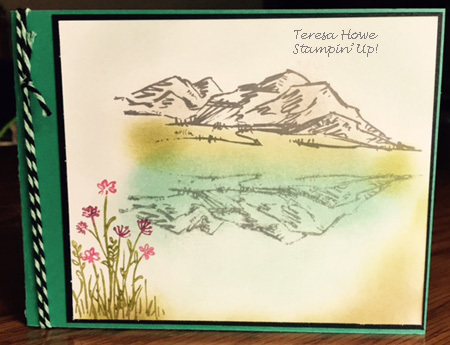 The mountains and flower are from the In The Meadow set in the Occasions Catalog. Such a great set and perfect for scenic cards. To create the reflection, first, stamp your image on your card stock. I used Basic Gray Archival ink. Then stamp your image on a piece of acetate (the sheet that comes in your Stamp-A-Ma-Jig also works well. Flip over your acetate and line it up with the image on your card stock. (Do this in the air so you do not smudge the transfer. When you have the acetate image lined up, set the acetate on your card stock and then rub across the back of the image to transfer the ink to your card stock. Remove the acetate and sponge ink to create your water surface for the reflection. I used Pool Party for my pond. I also sponged Old Olive for my grass, Smokey Slate for the mountains, and Soft Sky for the sky (not showing up very well in this picture). What do you think? Inspired to give it a try?